China’s central government has been promoting the establishment of water markets in recent years. Chinese water resources are owned by the central government under which regional and individual water users have only water use rights. Several pilot water markets have been established over the last few years in Hebei and Gansu provinces. Water rights in these areas are similar to those in Australia. These comprise (1) water entitlements that provide an ongoing share of a consumptive pool determined through an annual mean, and (2) water allocations, which are the water volumes assigned to a water entitlement in a given water season within a specified water availability. Water entitlements and allocations are all tradable permanently and temporarily. One such case of a pilot water market has taken place in the Shiyang River Basin, located in Gansu Province, northwestern China. The basin covers five counties with an area of 41,600 km² (see Figure 1). The total renewable water resources of the basin are estimated at 1.66bn m³, including an annual average surface water resource of 1.56bn m³ and groundwater resources of 0.10bn m³. Total water withdrawals in the river basin were estimated at 2.80bn m³ in 2000. The water resources of the basin have been overused, causing serious ecological problems. The population in downstream Minqin County have had to abandon their homes and livelihoods, becoming ecological refugees due to the desertification of their land. The Water Resource Department and the Development and Reform Commission of Gansu Province developed a Restoration Plan for Shiyang River Basin to address its water problems. The Restoration Plan was approved by the State Council of China in 2007 and funded with RMB4.7bn. A water rights system was applied in this plan, wherein water entitlements were endowed to users through water permits from the government. Users’ actual water rights (i.e., water allocations) are specified in each water season according to their water entitlements and the water availability at that time. 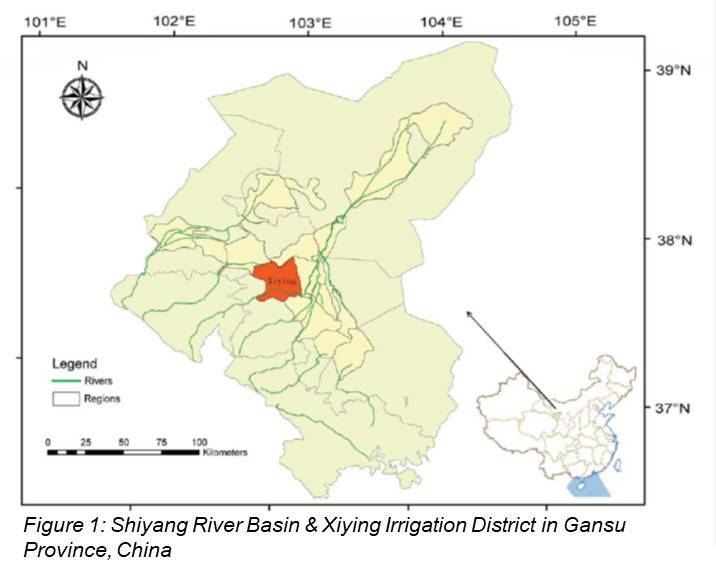 For example, the Xiying Irrigation District (XID) is a gravity surface water irrigation area in the Shiyang River Basin (see Figure 1). The average annual rainfall is approximately 280 mm, and the potential evapotranspiration is approximately 1,200 mm. The total population is approximately 156,000. The cultivated area is 444,900 mu (1 mu = 666.67 m² ), of which 238,000 are active irrigated areas. The water rights granted to the district have been codified and allocated to villages since 2008. Thus, a certain water volume is allocated to each village in the district as its annual water-use cap. In this case, several villages that tended to irrigate more farm lands bought water from other villages. Other villages with excess water sold water for profit. The leader of water users associations (WUAs) in the villages, on the behalf of farmers, sell water that is saved by group farming, plant adjustment, and drip irrigation. Each village normally has one WUA. In early 2008 trading activity was spontaneous, without supervision from the local governments. As more and more villages became involved in the market, the water management authority of the irrigation district started to regulate the market to relieve the third-party effects of the trading. Currently, the authority checks the applicants’ water availability, canal condition, and the price of their bid before approving their trades; and, the price of selling water among villages is limited to three times the price at which the villages paid the authority for annual water at the beginning of the year. Now, two types of water markets have been built in XID. The first is an offline market, in which buyers report their bids to the “market board” via word-of-mouth or phone, and the “market board” matches sellers with buyers. The second type is an online market for water users, supported by the Institute of Hydrology and Water Resources, Tsinghua University. The online market system can match sellers with buyers according to the information they report, such as location and volume. For both markets, a simple pool exchange method is employed for trade matching and price setting. Typically, trades between neighboring villages are preferred, which the market board and website each take into consideration when allocating the trades. The total surface water trading volumes for 2013, 2014, and 2015 were (respectively) 4.58, 5.96, and 8.15mn m³, and the total ground water trading volumes were 0.05, 0.41, and 1.28mn m³, marking the first successful online water trading system in China, demonstrating a huge potential for future development at a national scale. Despite growth, current Chinese irrigation water markets among agricultural WUAs are only developed in some arid river basins in northwest China. In most other river basins and regions of the country, water trading and markets among WUAs or famers have not been well developed because the bulk of water entitlements in the irrigation district have not been allocated to the WUAs or farmers, and the water usage of WUAs or farmers are not well metered. Nowadays, the central government of China is pushing a nation-wide water rights and water market system, which will certainly promote water trading in near future. 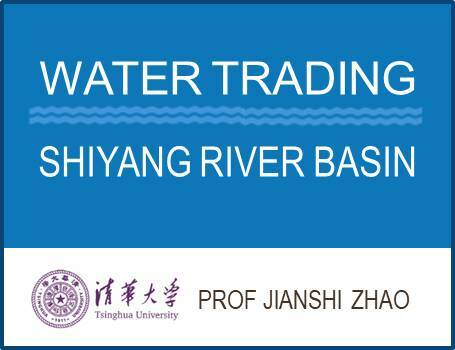 Professor Zhao Jianshi is a tenured associate professor at the Department of Hydraulic Engineering in Tsinghua University. He is also the director of the Institute of Hydrology and Water Resources. His research interests include water resources planning and management, reservoir operation and international waters. In addition, he is the associate editor of the Journal of Water Resources Planning and Management and a committee member of the China Water Resources Association (2013-present).